The Amateur Marriage - Tolle Lege!. Our natures determine who we are. The way we see the world whether through our passions, intuition, reason or rational thought (logic) makes our basic essence. The two main characters in this story have different essences and they and their family must learn to adapt or separate. Sometimes, reality is more complex than fiction will allow and our nature is changed by adding another unit. Unfortunately, for the protagonists in this story that is not the case. It turns out that truth can be stranger than fiction and a true story with all the same kinds of characters this book contains has already been written by the founder of Audible, Donald Katz, in the book "Home Fires: An Intimate Portrait of One Middle-Class Family in Postwar America". 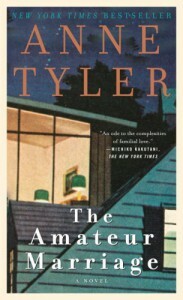 I would even bet that Anne Tyler was inspired by that book (not that there is anything wrong with that) and loosely based her story on that book, because all the characters within the "Amateur Marriage" have a counterpart within "Home Fires" and their story is more completely told while giving insights to the time period in greater detail. Truth can enlighten more than fiction and in the case of "Home Fires" it entertains even more than fiction did.